Beautifully cast silver filigree with a flower center surrounded by four teardrops. The flower's center features aqua blue beaded detail, and all the filigree components are set with sparkling jet black crystals. 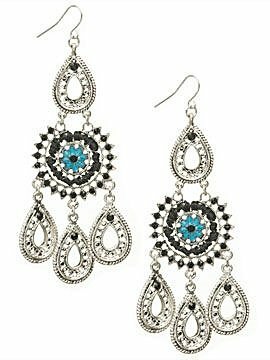 These dramatic earrings hang 4" from fishhook earwires. Please note that earrings are non returnable. Guaranteed authentic, 1 available.